All The Pretty Dresses: Lace Day! 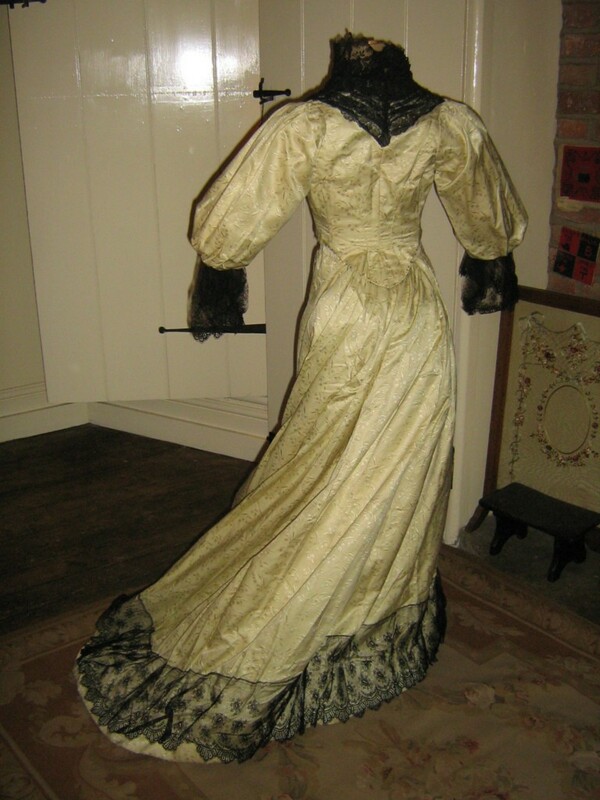 This charming Victorian gown dates [I think] to the late 1890's. The later the century becomes, the less research I have done, but I'm not far off. There is a little dispute about the colour. Bought at Bonhams, it was described as very pale green but to my eyes it is a very pale lemon - a touch away from cream, so it depends on how you see colour I think! The Bonhams label will be sent with the sale. The two piece dress is made of a figured silk with delightful lily of the valley florals. The silk is medium weight, soft to the feel and really robust, so easier to care for than the lightweight silks. 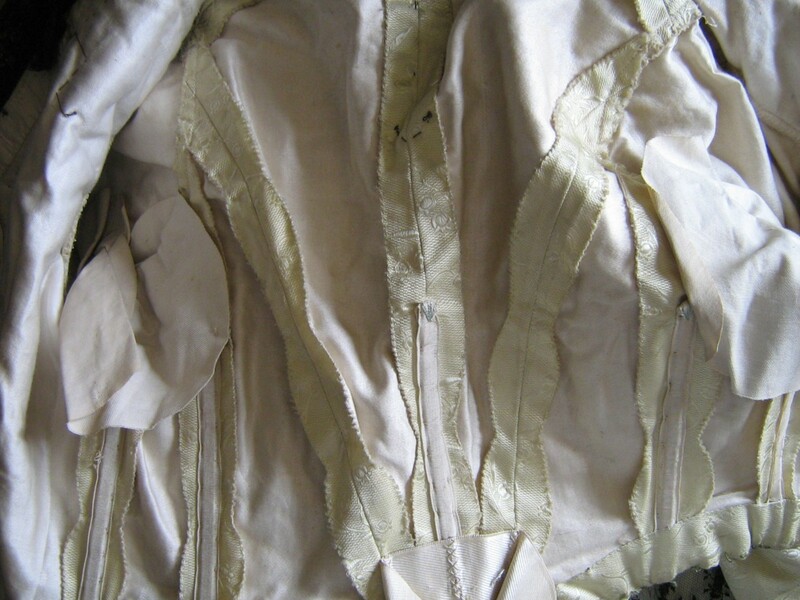 The bodice is tightly fitted with 11 short bones inside. This tiny body shape is made to appear even smaller by the huge sleeves so fashionable at this time. There is a nice tail at the centre back waist and a small one to the centre front, so the entire image is very curvy! 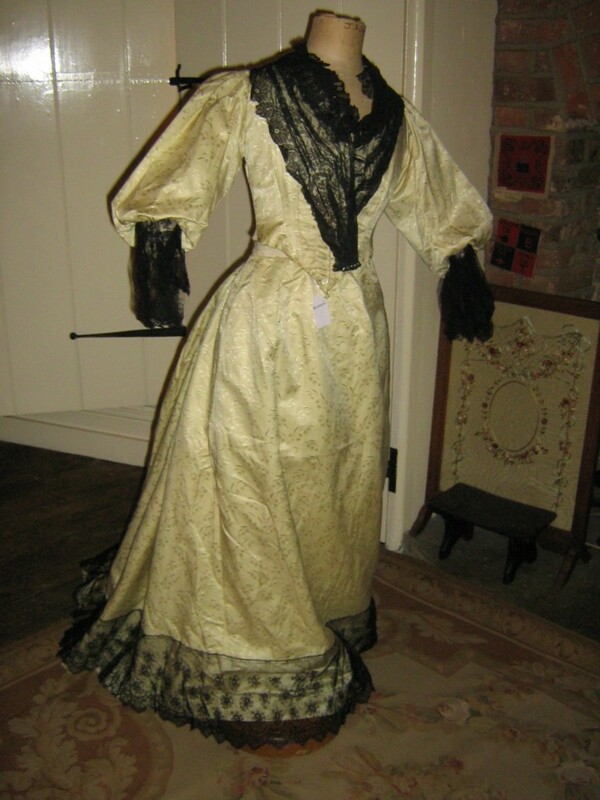 As you can see, the main decoration is black lace, profusely applied. It makes a shawl around the neckline, and then is ruffled and gathered to reach high on the neck. 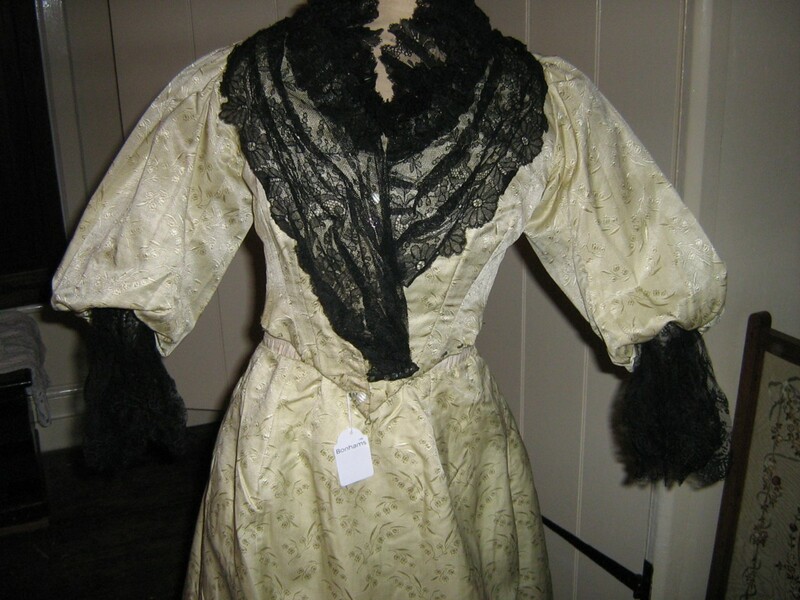 The edges of the sleeves are decorated with lace flounces. The fully lined and trained skirt is gorgeous and heavy! At the hem you will find black lace all around the outside. Turn it up and we have pleated gauze and white lace immediately underneath. Pull this up and there is a deep and stiffened pleated flounce. Pull this up to find the final layer, a silk dust band! So, four layers at the base! The inside of the skirt lining does have one set of ties, similar to a bustle, but I think these serve to hold the train in place as one walks, rather than to create a bustle - we are too late for anything but a very small bustle pad at the waist by this decade. Very good for age and very clean, underarms excellent inside and out. Slight discolouration around the buttonholes at the front fastening. 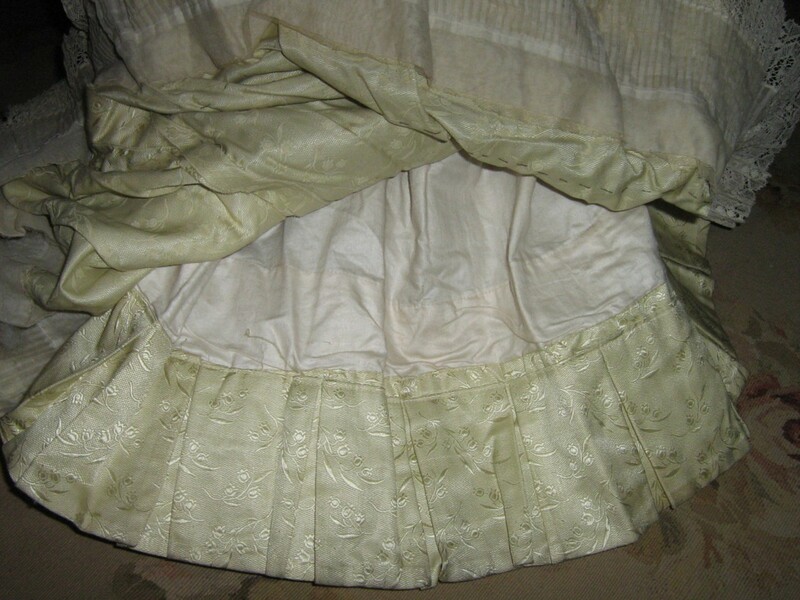 A few discoloured areas to the skirt lining. Three pearl buttons missing at centre front. Quite easy to replace as they are not fancy or large. Or, a set of jet-like black buttons would look lovely. 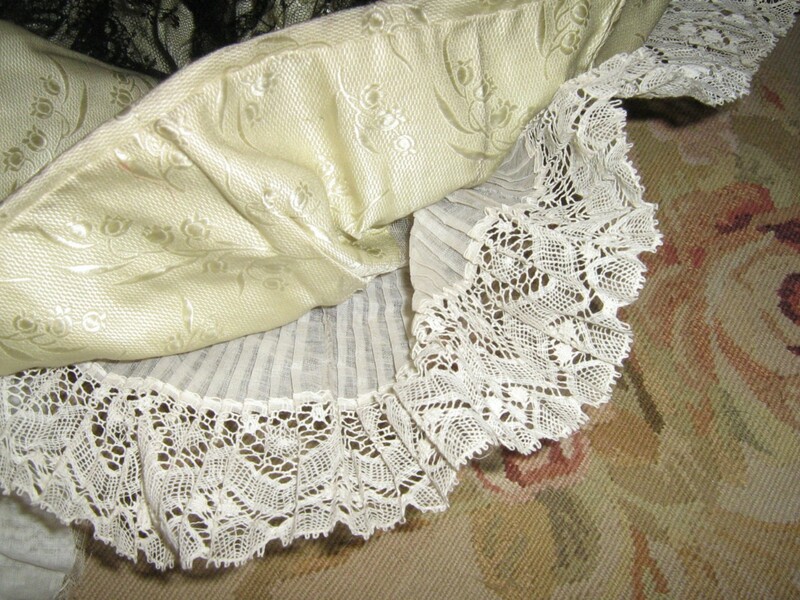 The lace is generally excellent, but one cuff flounce has torn and been repaired rather basically. Difficult to see. 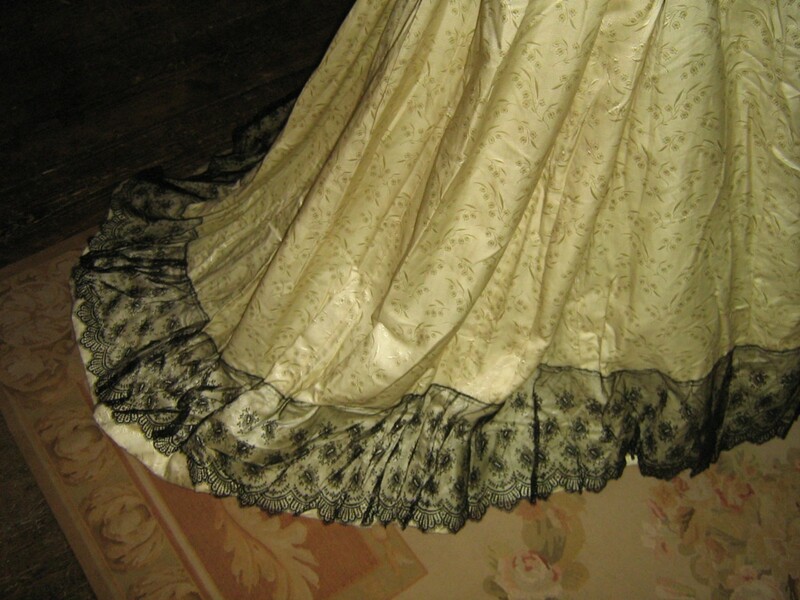 The skirt waist is strong webbing, below which is a very narrow silk band. This band is beginning to wear. Not at all noticeable, but will need keeping an eye on. 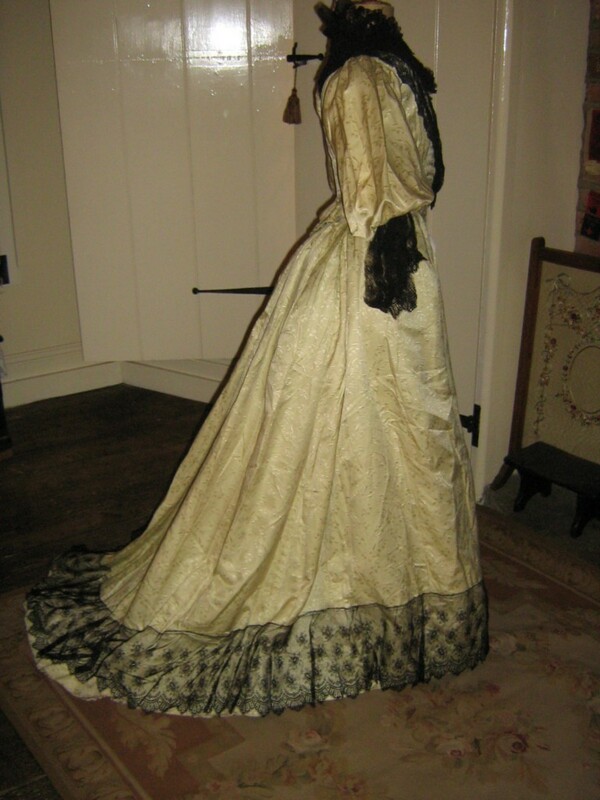 Finally, the gown would have had further black lace around the waist. The stitches for this remain. I would think it would have been a cumberbund, gently horizontally pleated to follow the curves along the bodice bottom edge. You can easily remove these stitches, but I have masses of black lace, so will send enough for you to make a simple cumberbund to replace it if you wish. 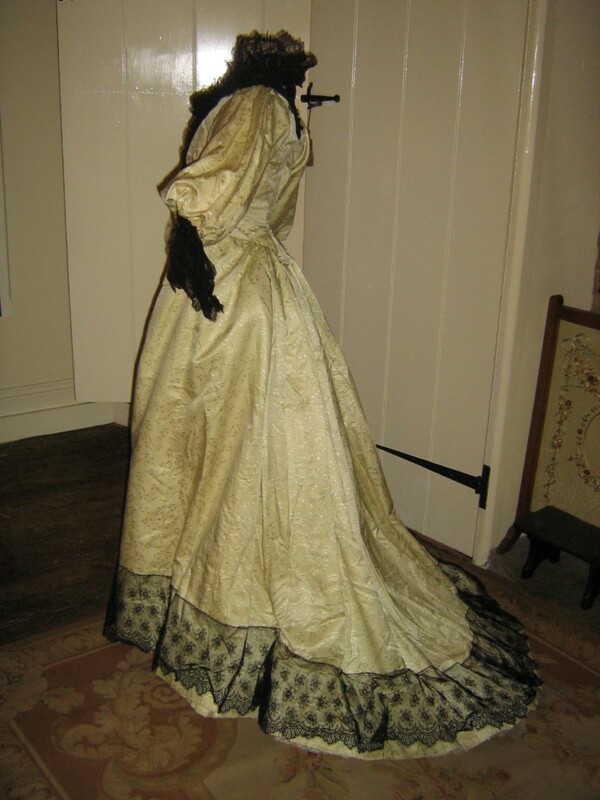 ******Please note I have found a couple of stitches to the skirt, so there may have been a lace bow or two here. My lace will be enough to make a large bow or two, if you wish to add more decoration. The bodice is quite tiny with a 29-30" chest and tight midriff. The waist is probably 23", although the skirt waist is just 24". Today is lace day! All things with lace or that look lacy or frothy will be added today. Same rules as the previous few days. Feel free to add comments!